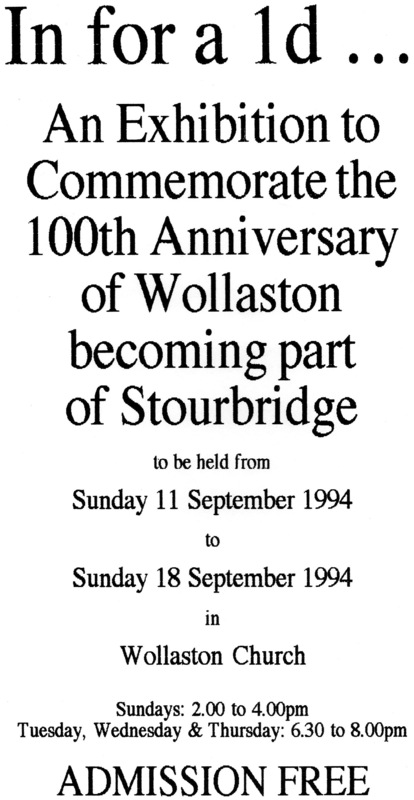 In September 1994 an exhibition was held to commemorate the 100th Anniversary of Wollaston becoming part of Stourbridge. The exhibition ran for a week from Sunday 11th to Sunday 18th September. The title of the event - In for a Penny - reflected the move by Wollaston Vestry Committee to make the decision to join with Stourbridge after being granted a concession that the rates paid by the people of Wollaston should be 1d (1 penny) cheaper than if it chose to remain independent. Better road maintenance, cheaper gas lighting and a reduction of the Poor Rate were also negotiated and on 11th September 1894 the Chairman of Worcester County Council recommended that the District of the Stourbridge Urban Sanitary Authority be extended so as to include the Township of Wollaston.